What are the best seats at the SSE Hydro? 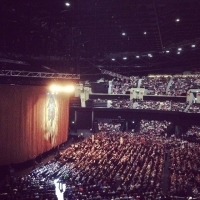 What is the view like from Block [...] of the SSE Hydro? Are these good seats? If you have any of these questions, you’re in the right place! 1. Look for the view from your seat in our gallery below. Each photo is labelled with the block, row and seat number and was taken by a real fan from the seat in question. No more guesswork! 2. Check out our seating plans (below). FIND THE VIEW FROM YOUR SEAT! Mobile users: click on any image to enlarge and open the gallery. Click on the left/right of photographs to scroll through the gallery. Desktop users: Hover over any image to display seat number. (desktop only) Click on any image to enlarge and open the gallery. Click on the left/right of photographs to scroll through the gallery. LOCATE YOUR SEAT(S) ON OUR SEATING PLANS! 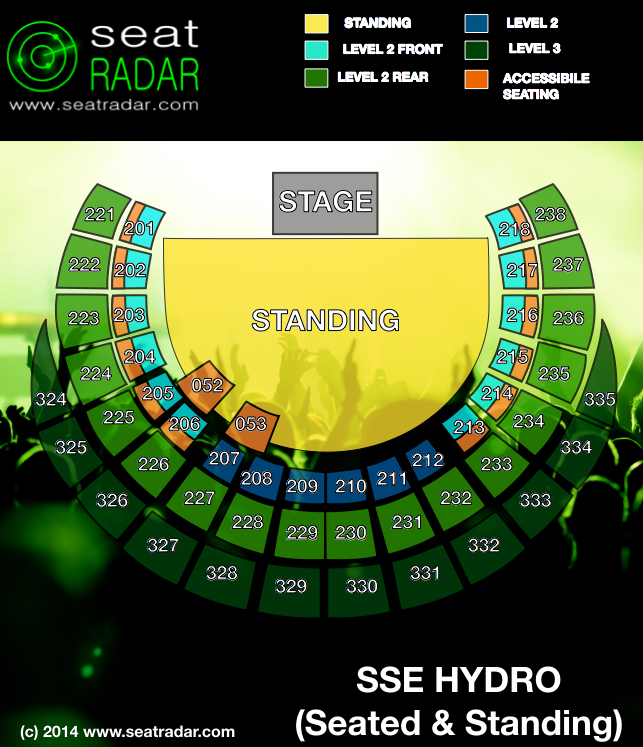 See the layouts for the SSE Hydro Seating Plan in our gallery below. (Click on images to enlarge). CALLING ALL GLASWEGIAN FOOTBALL FANS! Please check out (and submit your photos to) our new pages for IBROX PARK and CELTIC PARK! have tickets for blink 182. section stand row ga2 seats 111-113 cant seem to finds these any help? Hi My daughters have tickets for Ed Sheeran at sse hydro 202 seats 27-28 can you tell me if they will get a good view from there as I know it’s quite side on. Hi guys, I have tickets for still game in section 012 row J Seats 155 and 156, can’t seem to find the exact seating plan for the arena. So what’s everyone’s opinions on these will they be good seats? I have tickets for Black Sabbath on 24th Jan.
Level 0 seating, Block 052 Row J Seats 62-63. Are these good seats? Cannot find them on the seating [plan. 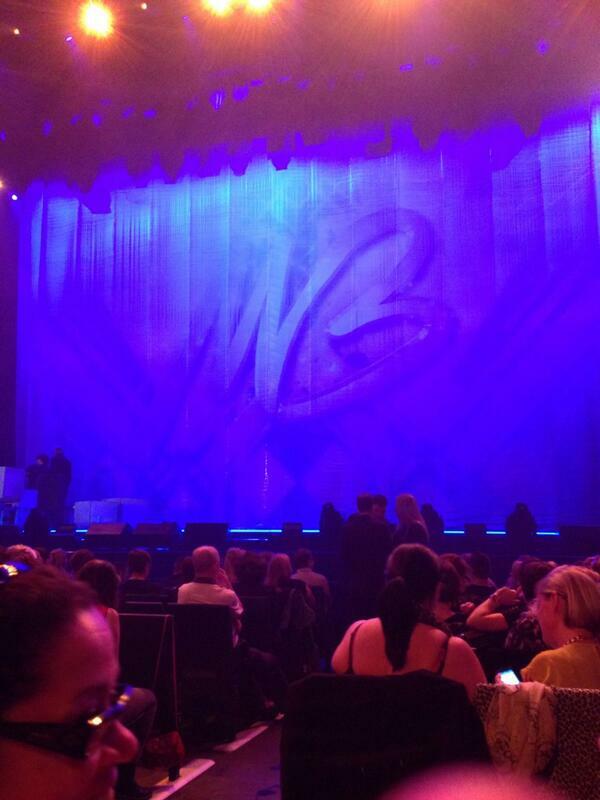 Hi there just about to buy mrs brwon boys tour tickets and see row D at the front seems cheap but unrestricted. Do you know why its cheap? I’m booking tickets and plan to bring my 6yr old daughter with me – really can’t decide what is better for her – good view and not too far away – between the raised floor seating in block 57 or to go up a level and sit in the front row of 216. Grateful for any advice. Hi I’ve tickets for Xfactor on 13/2 ,bk231 row p 239/240. I should have checked before ordering as Im not very good with heights and use a stick .Will I be ok with these or sell to friend and buy lower down . Hi, a friend and I are going to see 5SOS in April and we were thinking of getting seat 008 row AA. The only issue is that we’re both 5’2″. I know everyone is going to be standing but I am worried that we won’t be able to see the stage (although we might wear heels just in case). What do you think? Hi, I have tickets for wwe 2016 I’m in block 006 row P, will I still have a good view?? hi i just bought tickets for the 5sos concert it april in section 002, row T, seat 44-45. it is floor seating but i know that everyone will be standing so im not sure how good the view will be. im also aware that these tickets are at the back of the section, me and my friend that i am going with are pretty tall but will they still be okay? please can you answer soon, thankyou!! Hello! I’ll be attending Madonna in December and I’ve got tickets for Bk 12, row J seats 147 and 148. Are these seats any good? Are they close to the stage? Thanks in advance. Hi I’m seeing 50 cent next month I’m on row T seat 202-205 are these seats good? Will I still be able to get a good view and sound? Going to Madonna concert on 20/12/15 and ticket says BK05 but I cannot see it on the ticketmaster page. Where are the seats? What are these like for view of stage? screen? sound? Are there any barriers or anything? Thinking of buying tickets for the July Fleetwood Mac gig (because the June one was unbelievably epic!) Looking at Block 235 and Row P or R or Row 224 and Row Q. What are these seats like for views of stage and screens? Are there any glass barriers or anything in the blocks/rows I have mentioned? Well aware this is pretty short notice, so I’m not necessarily going to be mad if I don’t get an answer I’m going to see 5SOS on the 1/6/15, in block 228, row H, just wondering what the view will be like, I wear contact lenses so obviously I’m slightly concerned that my view won’t be fantastic – and I love this band so I’d be disappointed to not see very well. Thanks in advance! Just got tickets for Ariana Grande in Block 009 Row FF Seats 92-93. WillI be getting a good view there? Got ticket to Fleetwood Mac BK 239 406 what is this seat like? Omg same! I’m in block 004, and yes they’re at the side! The stage is going to extend out, see Ya there! I’m in block 009 Row FF, do you think I’ll get a good view? Hi there, looking to buy tickets for 5 seconds of summer. Tickets I’m looking at are block 202 row A seats 25 and 26. Was just wondering what the view would be like and what it would also be like sitting in the front row with it being tiered seating. Good seats not too high. Clear views and great sound system. Enjoy!! Hi, ive got 2 pairs of tickets to see 5sos in the hydro. Ive got 2 tickets for block 002 and 2 for block 55. I was wondering where the view would be better? So i could sell the other ones. Thank you! Both are awesome! I need tickets!!! hey i just bought tickets in block 002 for the next 5sos and i was wondering which one you chose? was 002 good? Hi! I’m considering buying Taylor Swift tickets but I’m not sure which section is better. I can either go for Block 326 Row Y or Block 333 Row CC. I know they are up high but I was just wondering what the view would be like before I purchase any tickets. Hi I have Taylor Swift tickets for Block 2, does this mean Block 002? Also, how is the view for this? Have seats 74/75,Block 004,Row R for Brian Wilson,what is the opinion on these seats please? 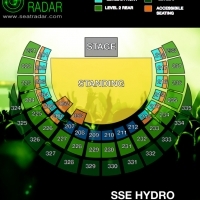 Hi admin, i got 3 tickets for one direction on wed 7th and they’re BK 004 RowE Seats66 – 68. 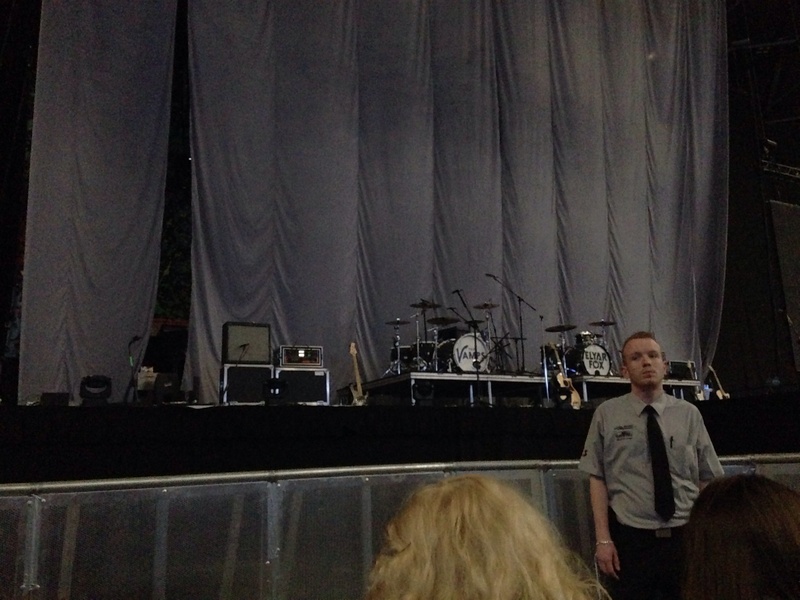 Are they good seats and how far from the stage are they? Hi Taylor – yup these are great seats, only 5 rows back and only a few seats in from the aisle between blocks 004 and 005 so nice and central too! Hi Allie, your seats are right on the aisle between Blocks 004 and 005 which is great since it’s the most central location in Block 004 and you’ll be able to get in/out easily. While you will be just past the middle of the block itself you are of course in the block closest to the stage so – other than particularly tall people right in front of you, you should be a pretty good place from which to enjoy the show! Have a great time and please do check back in with a photo! haha, i will thx so much! I’m going to see olly murs on the 16th April on the ticket it says section GA and also 148-150 does this mean we have designated seats ? Or should I come early to get a better chance of being at the front? Please help that’s. Hi Chelsea – please check with the venue if you’re concerned but the seating plan for this event shows a standing area and “GA” usually means general admission and STANDING – rather than seating. The fact that there are seat numbers on the tickets does not necessarily mean they are seated (not helpful we know!) – they can also just be there for tracking reasons. Assuming all that is correct then yes, you should arrive as early as possible to try and get to the front. I’m going to see Paul Simon and Sting next month block 004 Row D, will i get a good view of the stage from there? Hi David – I think we can safely say that being only 4 rows from the stage you should get a great view! Hi there. I just bought tickets for usher on 17th march blk 5 row A, am I right to think this is a front row seat? Hi im taking 2 9yr olds to one direction, they are not tall! Block 205 row d seats 75-77. Are these any good or are they going to have some trouble trying to see? Hi Nic – it’s tiered seating and the arrangement of the Hydro is pretty good for all-round visibility. In addition your seats are near/on the end of a row which will also help so they should not have any problems. Have a great time! Hi Gill – yes you are! Have a great time – please do come back and upload a photo! I have tickets for ariana grande in June. My seats are block 204 row E seats 64,65 just wondering if they are any good? Coming from Ireland so certainly hope I have a good view! Nice commitment flying over from Ireland to see your fav! Yes they are awesome seats! Have a look at the gallery at what is currently the second photo in the second row. It’s from Block 224 Row K Seat 74. Block 224 is the block directly behind/above where you’ll be and seat 74 of Block 224 is at a very similar angle as seats 64/65 of Block 204. So just look at the photo and imagine being 4 rows further down (or five in effect if you count the aisle between blocks 224 and 204) and that will basically be your view. Have a great time and please make a note to come back and upload a photo! Would be great to have a photo for the site after the show. When are you going? hello ! 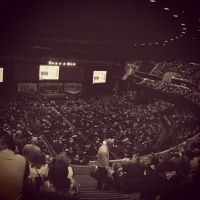 we have just purchased tickets for kevin bridges @ sse hydro ! black 050 row E 6-7 , are these any good ?? and what doea retractable seating mean ? thankyou ! Hi Deborah – they are towards the back of Block 006 but – ultimately – if you generally enjoy standing at concerts (yes, you have seats but it’s almost certain everybody in the floor seats will stand up!) then you can’t really go too wrong in Block 006! Have a great time! Hi Georgina – you’re going twice?! Lucky you You also have pretty good seats for both nights. In Block 012 you’ll enjoy sitting relatively close to the stage and while Block 226 is higher up, it gives you a really nice viewing angle over the stage and the crowd below. Have a great time! We are looking at getting tickets for the arenacross in Feb and the seats we are looking at are 224 Row N 79-82 I think this is behind the glass barriers, how good is the view behind the glass or is it better to try and get seats clear of the glass ? Hey Ross – yes we’d avoid being in the first row behind the glass barriers. The glass itself isn’t too much of an issue but there is a metal handrail along the top that can interfere with the view if you’re the “wrong” height! That said, we think that seat 82 might in fact be the first seat that is clear of the barrier section but please don’t book on our say-so – double check that with the venue if you decide to book those seats. Good luck! I’m going to see Ariana Grande in June and my seats are Section BK 004, Row P seat 69-70 and I was curious as to how good the view was?? Hi Keely – your seats are only a few seats in from the aisle between blocks 004 and 005 so they will be nice and central. While you will be just past the middle of the block itself you are of course in the block closest to the stage so – other than particularly tall people right in front of you, you should be a pretty good place from which to enjoy the show! Have a great time and please do check back in with a photo! Hi Admin I am also going to see Ariana Grande in july! I am so excited but I am wondering if my seats are okay? Its block bk 008 row NN seat 87. Thanks very much! Hey Hannah – well block 008 is of course nice and central and you’re seats are close to the aisle between block 008 and 009. Sure, in an ideal world you could be a little further forward since Row NN is towards the back of Block 008 but you’ll still have a great time we’re sure. Hey Laura! 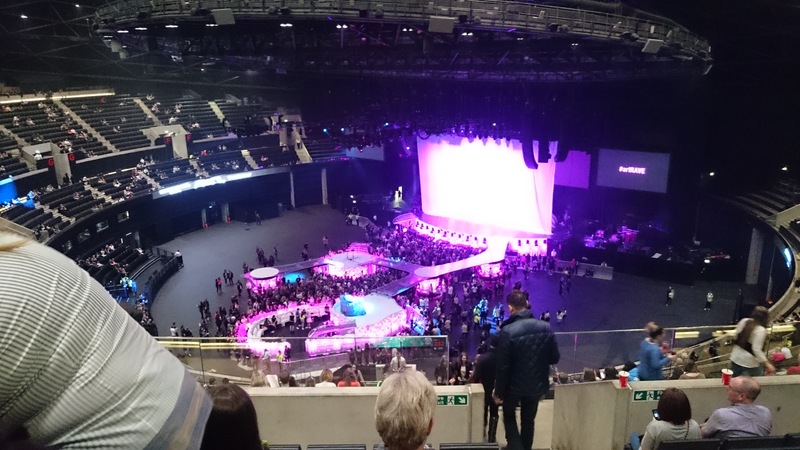 The tickets are towards the back of one the highest section so it’s clearly not a closeup type situation but the amphitheatre arrangement of the Hydro tends to mean the view is generally better from these sorts of locations than you’d expect. Check out the photo above from Block 332 which is next to where you’ll be. You’re a few rows higher but in a more central position so you’ll certainly have a reasonable view. All the best and don’t forget to upload a photo for us once you’re there! Hello, i was just wondering if you’d be able to help me with seating. Hi! 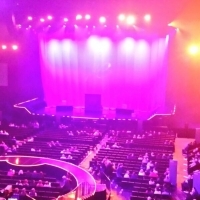 I bought tickets for Ariana Grande in June, we got seats in block 011 in row W. I am worried that we won’t be able to see anything due to these seats being both on the floor and at the back/side. What are these seats like? Hi Chloe, don’t worry those aren’t particularly bad seats. Have a look at the photo from Block 011 Row R – it’s a little dark but you can see how the angle is ok and it’s still fairly close to the action. You’ll only be a few rows further back. A seat number of around 135 would probably be idea for that block/row. Have a great time and please remember to come back and upload a pic! Hi Jenna – as you may be aware the layout for WWE is different to a music concert. 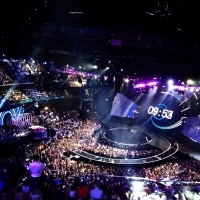 The focal point will be the ring area in the centre of the floor area so – actually – we don’t think it really matters that much whether you are “side on” since you are looking at a four-sided ring in which the wrestlers will be moving around rather than a static stage where the performers spend 90% of their time facing in one direction. Block 058 is on the floor and it’s an area of tiered seating (whereas the more central blocks (001 – 012) are flat. Not aware of any particular complaints regarding the retractable seats. 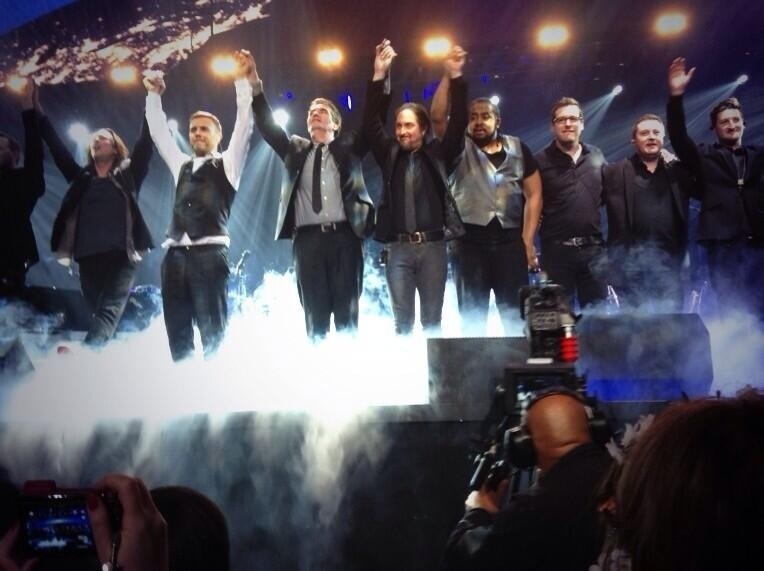 We look forward to seeing a pic from you after the show! Hi Tyler – in an ideal world you would of course seek to be closer to the stage since your seats are pretty much right at the back of the floor seating area. There’s nothing wrong with the block’s angle/location per se but it’s just a distance thing and the possibility that if everybody stands up it could interfere a little with your line of sight. That said if you’re fairly tall it shouldn’t be a major problem. You’ll also have a good view of the screens not that will help. I forgot to mention that we are in row cc (whatever that means) in block 328. My wife and I are going to see U2 at the hydro in November 2015. Our tickets are for block 328. Is the view good from here and are there any issues with this area? I know we are high up and at the back in a central location. We were wondering whether anything could obstruct our view of the stage from here? Hi Paul – the first row in that section is W and then it goes W, X, Y, Z, AA, BB, CC so you’ll be 7th row. You’re aware of location/height etc. There shouldn’t be any obstruction from that position. There is a glass barrier with a metal rail at the front of the section but shouldn’t be an issue in Row CC. Have a great time. Hi Caroline – yes not bad seats at all nice and central and right up against the aisle with Block 210 Would love a photo for the gallery. Hi, got One Direction tickets and are in Section 223 and row R, any idea how these seats are? Hey Zoe – those are pretty good seats Take a look at what is currently the 9th photo in our gallery. That’s from Block 222 Row V. You’ll have a better viewing angle (less side-on) and be a few rows lower/further forward Hope you’ll come back and upload a pic for us – which date are you going to? Can you tell me where we will be ???? 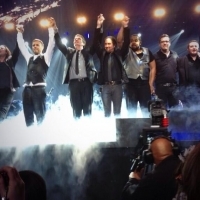 Hi Lesley – we’re not sure of the code but as far as we know there will be three standing areas at Take That. 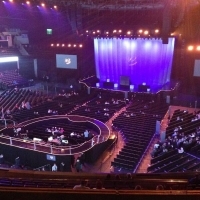 A large general area and then two “pits” right in front of the stage, one on the left and one on the right. On that basis, it sounds like you are in the pit section on the right hand side hence PIT-R(IGHT)! The row and seat numbers are probably irrelevant save for the purposes of the venue tracking ticket numbers. If you have this confirmed please do let us know! Enjoy the show and be sure to set a reminder in your phone to ping us a photo in April! We ended up being in the pit right at the front of the stage and the view was awesome! Take That were almost within touching distance!!!!! Was well worth paying that little bit extra for these great tickets! was looking to purchase pricey tickets for a concert, would like to know if BLOCK 9 ROW JJ SEAT 92 is worth the money? Hey Jamie – we’d say they’re pretty good seats. Take a look at the 15th photo in our gallery taken from the mixing desk area. Your seats are just to the right of that so hopefully that helps you gauge how much you’d be willing to pay! Looking at XFactor Live tickets for an adult and child age 8 and have 3 available options – BK053 row D, BK004 Row H or BK229 row H – which would be best?! Thanks for your help. 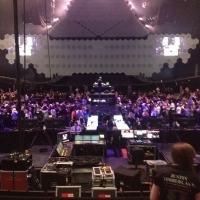 Hi Amber – Block 004 are the closest (very close to stage in the flat floor-seating area). These are awesome seats. The only potential issue with an 8 year old will be if there are many taller people in his/her direct line of view that stand up in front of you. While Block 053 is tiered it’s further back and being only in Row D won’t add that much height and you might potentially still have an issue seeing over people standing in the floor seated area. That means that you’re down to a choice between Bk229 and Bk053. Nothing wrong with the seats in Block 229 – nice central location with good viewing angle but seems a shame to sit right at the back when you could be in Block 004! So – in your position we’d probably choose Block 004 and hope for the best – at least you’ll be close to the action and really get a great sense of being in the thick of it! Hi Suzanne no problems in terms of the location/angle of the block and you’re only two rows back. That said, if you’re ten year old is average/short for his/her age there is a chance that your view might be slightly affected if many tall people stand up in the floor area. I can’t decide which tickets to keep. I have Block 012 row P seats 144 and 145 or Block 011 row S seats 126 and 127. Can you give me an idea of which seats would be the best view? It’s for Diversity thank you! Hi Lisa – you’ll be noticeably closer in Block 12 with a similar angle from both blocks. Seats 144/145 are right by the aisle so that’s another plus point. Block 12 wins it for us! Hi Esther – the seats are high up – no denying that but many people still enjoy a show there provided no fear of heights. You may well end up looking through the glass when seated which is not ideal but the main thing is to hope that the balustrade is not at eye level (which some people do find and means you’re trying to look over/under it…). Sorry to be the bearers of bad news – hope it’s ok on the night and would be great if you could back to let us know and upload a pic! Hi can you tell me what the view will be like from block 229 row T – seat numbers 198 to 200. 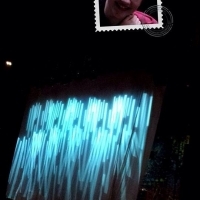 I got really good seats first thing and my pic crashed!!! There’s not much in it but since Block 002 is floor seating, depending on the way the stage is set up and how tall the rest of the audience is there’s some possibility that if everybody stands you’d have a slightly impeded view so actually you might be better off in the seats you already have in any event if you don’t mind being a little further back/up. hi, just purchased block 11 seat 135-137 for s club on presale? are these seats any good or would i have been better trying to get them on general sale? Hi Lynn those seats are very much a side-on view. We’ve seen a photo (not yet been upload by the relevant user yet unfortunately) from Block 222 and the view from there is side-on but still acceptable. Further to the side (i.e. Block 221) the view is likely to be a little more difficult. At best, you’ll be pretty much at right-angles to the stage. Depending on how the stage/screens etc are set up you may not be able to see a screen easily and you’re unlikely to get a good view of any screens/effects at the very rear of the stage. That said you should still be able to see enough of the stage to enjoy the show and you’re close to the front of the venue and close to the action. Plus, ultimately – it’s Fleetwood Mac not SClub7 (!) so it’s all about the music, no?! Have a great night and we’d love to have a photo for the gallery after the show. Will definitely send a picture. Thanks for your advice thought the seats where side on but as you say it’s all about the MUSIC!! And the atmosphere. Might never see the original 5 again. Hi Mags, thanks very much. We’d probably keep Block 011. If being close to the aisle is a factor you’re in luck since both sets of seats are very close to ends of their respective rows. Excellent. Thanks for that guys. I’ll send photos from both seats . Hey Elise! Yes they are awesome seats! Have a look at the gallery at what is currently the second photo in the second row. It’s from Block 224 Row K Seat 74. Block 224 is the block directly behind/above where you’ll be and seat 74 of Block 224 is pretty much at exactly the same angle as Seat 59 of Block 204. So just look at the photo and imagine being 6 rows further down (or seven in effect if you count the aisle between blocks 224 and 204) and that will be your view. Need we say more? Yay! Thanks so much!! It’s next June, so I’ll take a pic of my view when I go and send it in to you!!!! Hi Darryl – unfortunately nobody has submitted a photo from the block (would be GREAT if you could since it does come up fairly often in queries). Don’t worry though we have been shown a photo from the block (sadly not uploaded by the user in the end) and the view is better than people expect. It’s side on but you’re not behind the stage – you’re pretty much at right-angles to it. 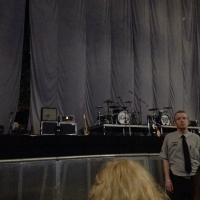 On the plus side you are near the front of arena and fairly close to the action. 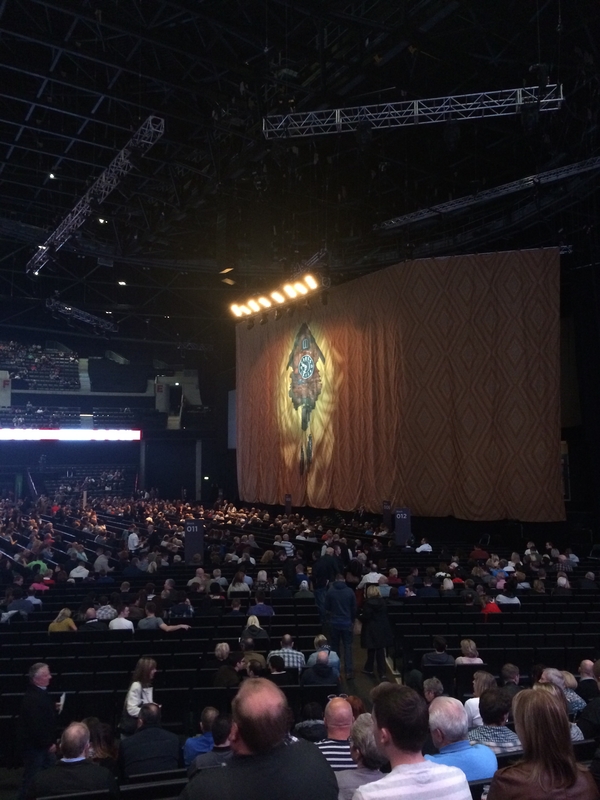 On the downside, if The Who make extensive use of the screens at the rear of the stage you may miss out a little as these will be likely be very difficult to see. Have a great night in any case! 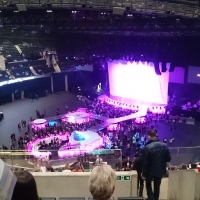 Never been in SSE Hydro before. What are these seats like? Hey Samantha. 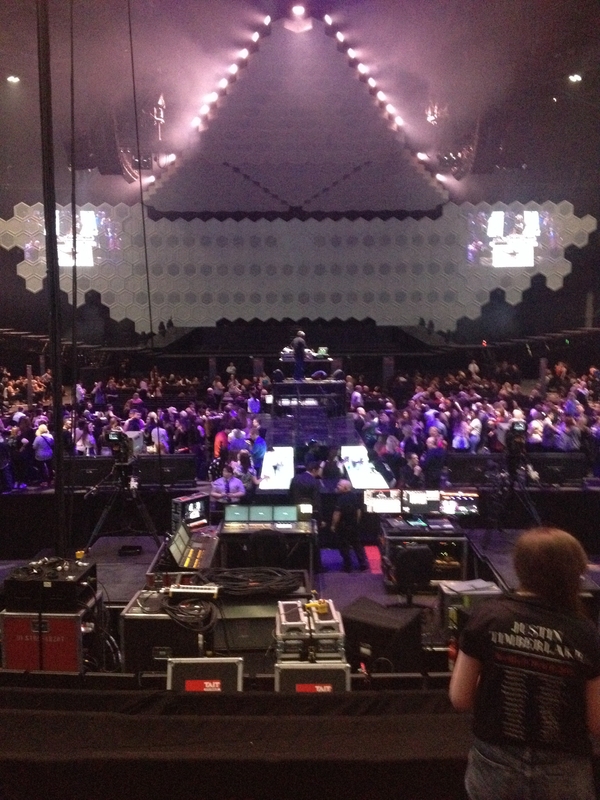 Block 229 is a nice central location meaning you’ll have a great straight-ahead view of the stage and screens. The block starts at Row H so you’ll be just over halfway back. Your seats are fairly close to the aisle Block 230. Sound-wise you should be fine given the central location. The seats are fairly high-up but the 200s are generally fine for most people – it’s only usually in the 300s that people with a fear of heights etc generally report feeling uncomfortable etc in our experience. 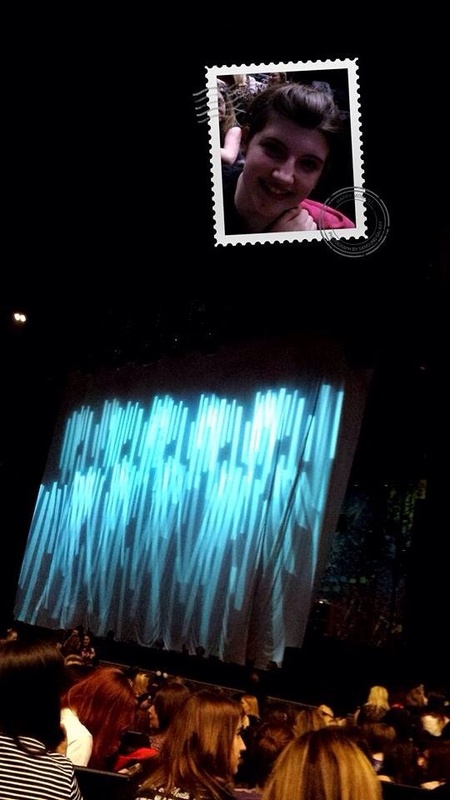 Enjoy the show and please do come back to upload a pic! If you have any from other venues in the meantime we’d love to have those too! Thank you so much Been waiting a lifetime to see Fleetwood Mac so you’ve helped set my mind at ease a bit. Can I be a pain and ask another question? A friend and I have just got tickets for Bette Midler in July: Block 206, Row B. What are these seats like for view of stage/screens/sound, etc? Hi, just got (expensive) tickets for Fleetwood Mac next June. I’m in block 012, row N, seats 148 and 149. Is the view worth the notes? Thanks, super stuff your doing here, much appreciated. Looks like I’ll have a brilliant view. Roll on June!!! 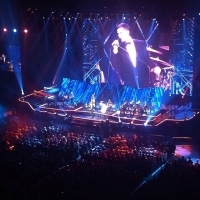 Take that – section BK, Row W, Seats 58-61, what are they like? Hey Yvonne – you don’t mention the block (BK is just “block” there should be a number too) but are you in Block 325 perhaps? If so you’re in the front row of that block, roughly in the middle of the row. Angle-wise you should be fine and will be able to see the stage ok etc. Main issue there will be that you’re pretty high up so hopefully you’re not scared of heights! Hi Liz – there is a tunnel beneath those seats but won’t impact your view/comfort. 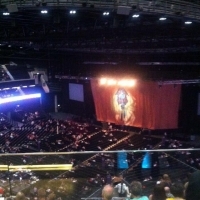 Have a look at the photo above taken from Block 224 Row K (it’s the “mirror” block on the opposite side of the arena). That’s not from above the tunnel but it’s from roughly the same height and you can get an idea of the viewing angle (rather good). Also, you can look across to Block 236 on the other side. Hope that helps. 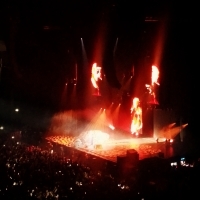 Hi Stacey – first the pros: you’re very centrally located and will see the full width of the stage and get a great sense of the show as a whole (as you can see all the effects on any screens etc behind the group as well the screens to the side). Sound should be fine there too (again because it’s central). The cons are of course that you’re at the back of the stadium – although this is a matter of preference really – some people prefer to be nearer to the stage even if it means being side-on whereas others prefer a nice direct line of sight (such as you’ll have). The main downside is of course the height but if you check out the photo from Block 332 above that will give you some sort of idea (although you’ll be able 7 rows further back/up). Unless you struggle with heights (e.g. vertigo) your seats are probably in the middle of pack in terms of how good they are once you factor everything in. Hope that helps and it would be great to have a photo for the site from up there! Please do remember to come back and upload! When’s the show? Great – when are you going? Would be great to get a pic up after the show! I have just bought 2 tickets for Take That and noticed im sitting in section 237 which is way to the side. Will I still be able to get a good view of the show? 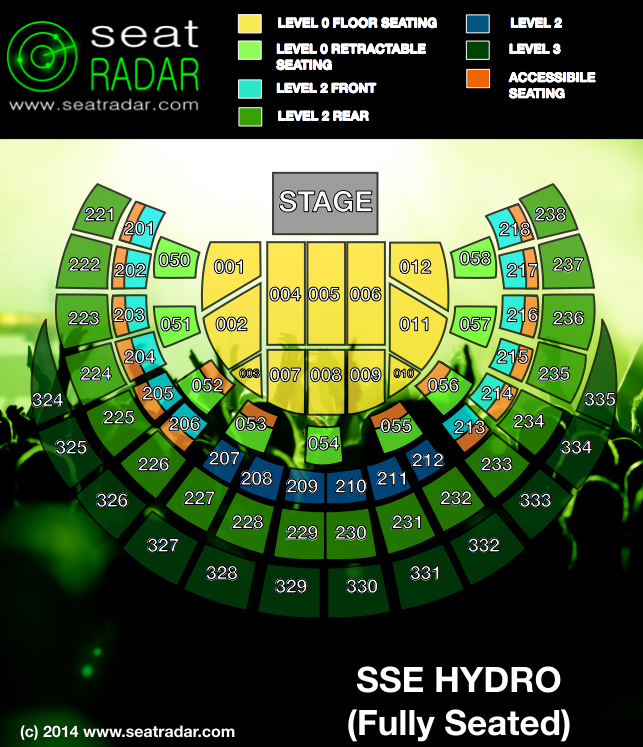 We’ve just bought tickets for the Hydro and are in Block 330, Row W, Seats 204-206. I know these are far back but do you know if these are decent seats? Thank you. Thank you admin. I’ll get a photo from the seat! Hi I’ve bought take that rickets today in the pre sale and I was under the impression I was standing but in my conformation it says Row GA7 seats 213 – 216. What does this mean? And am I definitely seating? Hi Karen – we’ve come across this a few times before (have a browse through some of the other comments). We suspect that you are indeed standing and that the numbers are just for the arena’s reference but we always advise people to check with the venue if they are very concerned. Would be great if you could make a note in your diary to come back and let us know after the show! Hi! 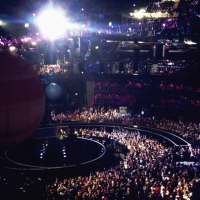 I’m going to the MTV EMA’s tomorrow night and I’m sitting in block 205, row D. However, I bought restricted view tickets. Do you know if they are good seats and do you know how/why our view will be restricted? I have bought tickets for McBusted Block 012 Row K seats 142-144. What is the view lick from here? Also how far back is it. Like does this block start at row A? Hi Gemma, yes block 012 starts from Row A. Row K isn’t too far back though and actually seats 142-144 are probably the best seats in that row as they are right by the aisle with block 011 so you’ll have a better viewing angle and also be able to get in/out easily enough. Have a great time! When are you going – will you be able to come back and upload a photo? Gemma I have tickets for still game in section 012 row J Seats 155 and 156, can’t seem to find the exact seating plan for the arena. Whats opinions on these will they be good seats? Hey Andrea if you looked out from the stage Block 223 would be to the right. We have a photo from Block 224 in the gallery. You’ll be slightly further along the side (but not a problem) and closer to the stage. Hi there, have tickets for Taylor Swift block 218 row A, I’m worried it’s so far to the side I won’t see the show well, can you advise please? Hi Al – yes those seats are definitely a side-on view. We’ve seen a photo (not yet been upload by the relevant user yet unfortunately) from Block 222 (which is the equivalent of Block 217 on the other side) and the view from there is side-on but still acceptable. Further to the side (i.e. Block 221 or 218) the view is likely to be a little more difficult. If you are in Block 218 then the lower your seat number (under 295 ideally) the better. Hi, I have bought tickets as a surprise for my daughter to see Taylor Swift . 330 row GG Will the view be ok at this height ? Hi Sarah – probably comes down to personal preference/comfort on this one! 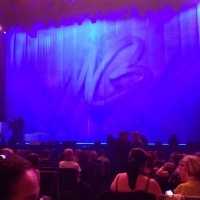 You’re view there would be at a slight angle but we wouldn’t see it as a problem ourselves, not bad seats in all and no reason why you shouldn’t have a great night. Of course, if you prefer to be right at the front with a dead straight-on view then sure go for standing tickets and get those elbows sharpened! Hi, what will my view be like at Taylor Swift from block 221, row H, seats 10-11? Hi Jen those seats are definitely a side-on view. We’ve seen a photo (not yet been upload by the relevant user yet unfortunately) from Block 222 and the view from there is side-on but still acceptable. Further to the side (i.e. Block 221 or 218) the view is likely to be a little more difficult. Depending on how the stage/screens etc are set up you may not be able to see a screen easily. With this sort of seat your best bet is probably to check with the venue directly as well just to be sure. 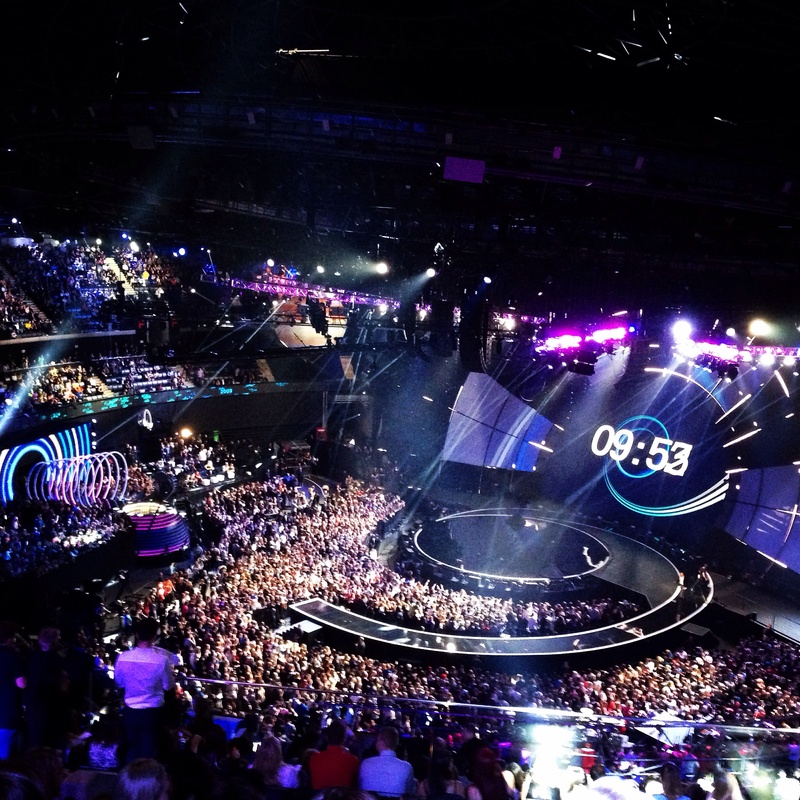 Hello, I’ve bought a ticket for the EMA 2014 that will take place this sunday. The spot I got is pretty far from the stage.. I got the Section: BK 326, Row: CC, Seats: 80. Any chance I can see something from there? Hey Luna! The tickets are towards the middle/back of the highest section so there’s no denying you probably won’t be able to see the detail on the presenters’ faces…But fear not – the amphitheatre arrangement of the Hydro tends to mean the view is generally better from these sorts of locations than you’d expect. Check out the photo above from Block 332 which is more or less in a similar position to 326 just from the other side of the arena if that makes sense. You’re not much further round or back than that so the view should be fairly similar and you’ll definitely be able to see at least one screen. All the best and don’t forget to upload a photo for us once you’re there! Hi just bought 4 tickets for block 003 row R are there good seats? Will my kids aged 8 and 10 have a good view? Hey Carolyn, yes they’re perfectly ok Please do come back and post a pic! Hi , I have tickets for Enrique in November . they are bk 004 row f seats 68 and 69 . Enrique (bk 004 row f seats 68 and 69): smashing seats. Near the front, centrally located – what more could you want! Hi Carol the view is very much side-on but it does of course depend to some extent where exactly you will be sitting. Lower seat numbers (i.e. around the 175-180 mark) and the front few rows (A – D) likely to provide the better views from 058. Hi can you tell me if section BK 225 Row: M Seats: 112-113 for Disney on Ice 2015 is within section 225 on Seating plan for Glasgow Hydro? As cant find BK 225? Hi Nicole we believe there is only one block 232 (on 2nd level). Where did you see a plan showing two? Hi Kirstie – sorry we were doing our best to track down an actual photo from Block 237. We haven’t had one in yet unfortunately. That said, we’ve seen a photo from Block 222 which is essentially the same position just on the opposite side of the stadium and the view isn’t bad. You’re pretty near the stage and can see right the way across it (albeit sideways). The only issue might be difficulty seeing the stage screens and some people sometimes report a slight echo in those side areas depending on the sound setup. Have a great time and please remember to upload a pic! Thanks! Hey Rachel, Block 057 is floor level (but tiered) towards the stage end of the stadium. 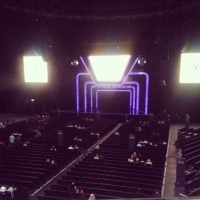 You’re also only two rows back so in terms of being relatively near the stage they’re good seats! Are those definitely your seat numbers? Last time we checked seat numbers in Block 057 didn’t go that high but as it’s retractable seating perhaps it’s flexible and the numbers change sometimes. Either way, if you’re nearer to Block 056 rather than Block 058 you may have a better viewing angle. Hope that helps, enjoy the show and do come back to upload a photo as this is the best way that we can help fans really check their view! If you have any photos from other gigs at the Hydro or elsewhere please do upload them! Hey Alison – thanks for letting us off the hook as regards the Vertigo, that’s a tough call for us! The sound might be slightly better in 327 as it faces the stage more directly. That said – and vertigo notwithstanding – we’d go for 204 Row A given the choice as it’s nearer/lower but everything is ultimately down to personal preference! Which show are you going to? Going to the Tuesday one on 28th. Thanks for your advice. Are there glass barriers at the front of level 3? I’ll post a photo from wherever I end up sitting . Hey Alex! Check out the 2nd last photo in the second row above – that’s from Block 332 Row Y. You’re just a few rows further back but Block 331 will have a less angled view. You’re not far from the aisle between Block 331 and 330. So overall you’re view should be at least as good as that photo from Block 332. That said, some people do say that from that position you might find yourself looking more at the screens but that it’s still an enjoyable place to enjoy a show! Do come back and upload a photo after the event! hey im seeing the vamps in april and i have Block12 RowJ Seats142-143 can anyone tell me if they are good seats? Hi Amelia – some of block 12 is slightly side-on but you’re very close to the aisle between 012 and 011 so you should have a good view. You’re also pretty near the stage there and should also have a decent view of the big screen on that side of the stage. Enjoy the show and and don’t forget to come back and tell us how it goes and upload a photo! I have just purchased tickets for Noel gallagher next march. My Seats are Block 215 Row A, I paid £156 for 2 tickets as these were top price seats, does anyone know if they are good seats? Do come back and tell us what you thought and upload a pic! awesome! look like great seats then? p.s. Noel Gallagher tickets…nice work! Hi Colette – only you can say how far away is “too far away” but the last photo in the second row is taken near the mixing desk and you’re about 5 rows further back. 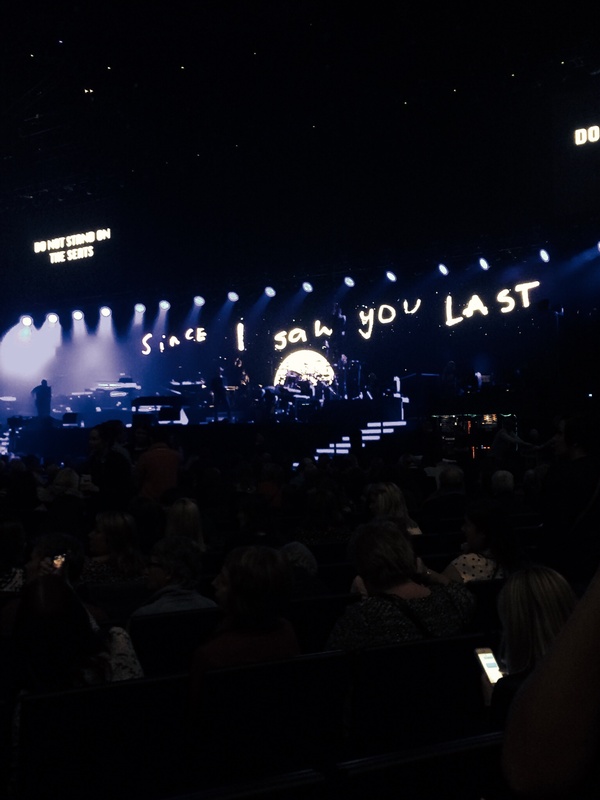 For us that’s not a terrible place to be sitting and we think your view will be fine but do come back and let us know what you think (and upload a photo) after the show! I am sitting at section 12, row H, seats 144 and 145. are they any good? Hi Mirren – some of block 12 is slightly side-on but you’re very close to the aisle between 012 and 011 so you should have a good view. You’re also pretty near the stage there and should also have a decent view of the big screen on that side of the stage. 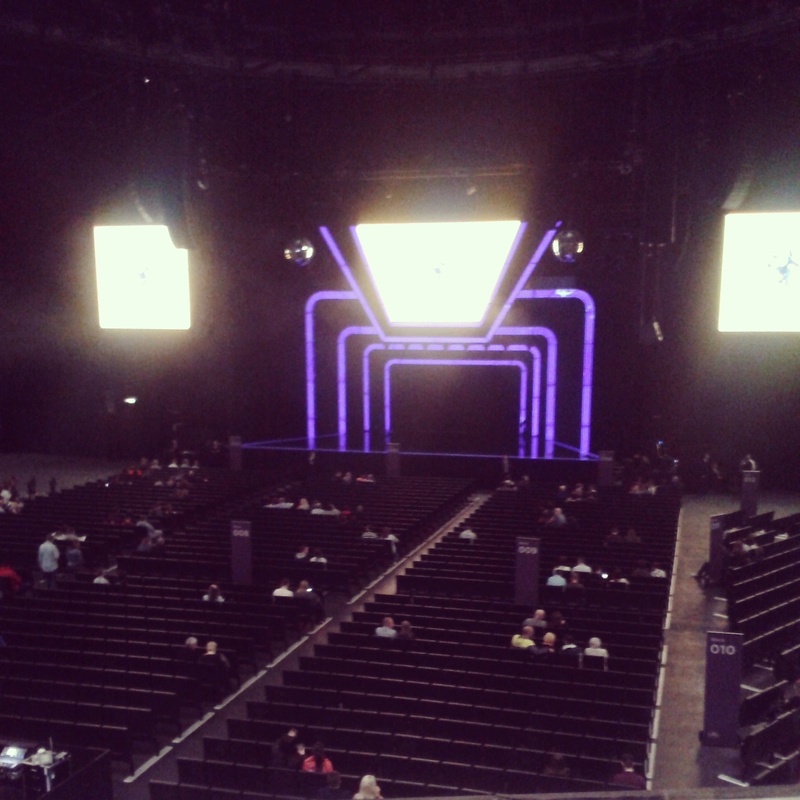 Enjoy the show and and don’t forget to come back and tell us how it goes and upload a photo! Hi I have bought tickets for kevin bridges next year at the hydro the best tickets I could get for 4 seats together is in bk 237 row L seats 397-400 are these seats any good? Hey I have tickets for the vamps and our seats are bk 204 row c seats 56-59 are these good seats? Near the stage? Hi Rachel – are you sure about those seat numbers? They would usually be in Block 230 but perhaps his gig is laid out differently? In any event, unfortunately we don’t really know about number of stairs etc, best to check that sort of thing with the venue itself. 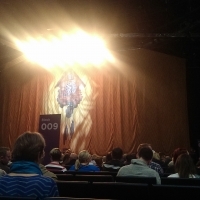 Block 058 is side-on but to some extent it depends where you sit in the block but again you should ask the Hydro to confirm you won’t have a restricted view. Hi I have tickets for the vamps Block 12, Row F, Seat 146 is that any good or near the stage? Hi Fiona, they are indeed! I know the show’s a while away but please do remember to come back and upload a photo of your great view! I have seats for the Neil Diamond concert in July 2015 – Block 51, Row F, seats 35-37. How good are these seats? Hi Eileen, they’re good seats. Raised from floor area and tiered, good position in the row (near to aisle) and decent viewing angle! 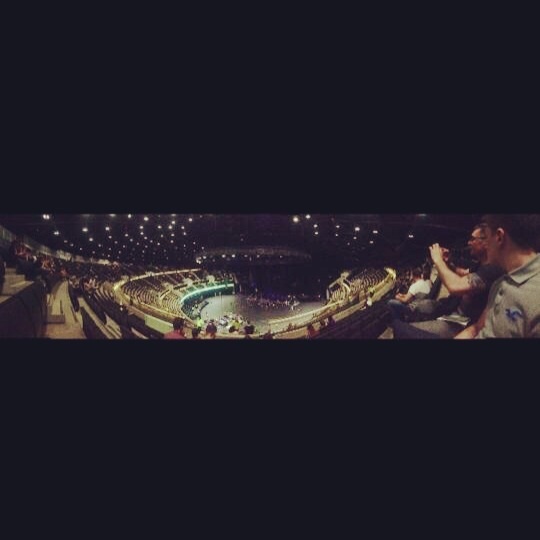 Enjoy the show and don’t forget to upload a photo from the night! Have tickets for lee Evans block 11 row x 122-125 any good ?? Hi Ian – if you look at the first photo in the second row above, this shows the view from Block 011 Seat 132 which is a very similar view save that you will be sitting a few rows further back (and hence slightly higher up). 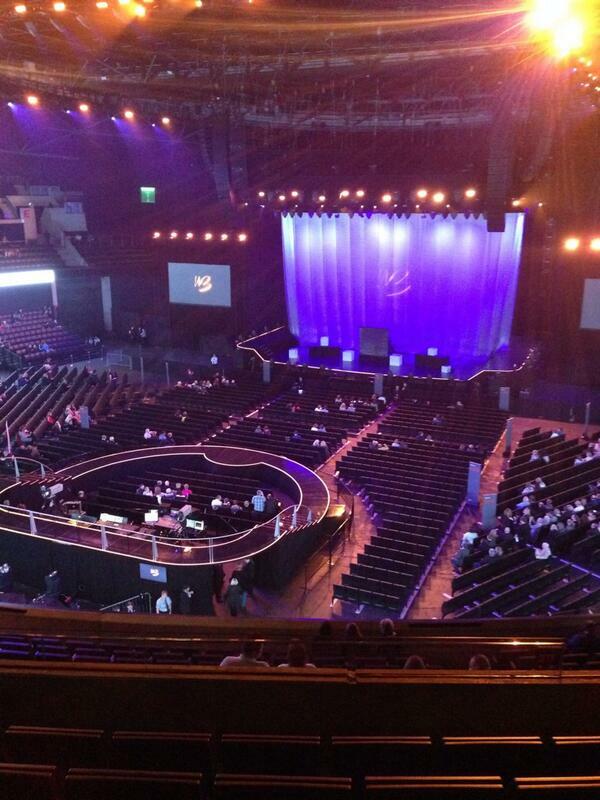 You should have a pretty good view of the full width of the stage as well as at least one of the big screens. Have a good time and please do upload a stageview pic to seatradar.com! Got tickets for block 52 row H seats 61-62. How is the view from there? Hi Darren, they are good seats – you’ll have a good view! How’s the view from section bk236 row v seats 358& 359? Just bought tickets to see The Vamps in April 2015. Block 216, Row D and seats 253-254. Are these seats any good? Hi Abbie! You can get an idea of the height by looking at some of the other photos above from that level but our opinion is that the view from the 200s is fine. Your angle won’t be a problem in Block 216 and seats 253/254 are good as they are towards Block 215 (i.e. less angled than the other side of Block 216) and you’re also near/next to the end of the row so easy to get in and out! 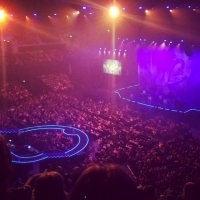 Have you been to the Hydro before? Any photos you’d like to upload? Hi Charlie, pretty close to the stage, in a floor-seating area. Viewing angle usually fine from there. Only issue could be if particularly tall people in your immediate line of sight since it’s not tiered. Another + point is that you are sitting near/next to the aise so easy access. Enjoy! Hi, I’ve brought tickets to see Kevin Bridges my seats are block 004 row R, can you tell me how close/far they are to stage? 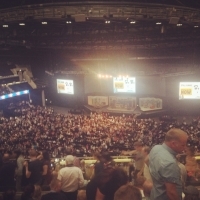 Hi there, I recently bought two sets of tickets to see Lee Evans at the SSE Hydro. The first ones are Level 0, block 057, Row H, seats 162 and 163. 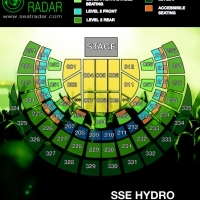 The second set I bought include Level 3, block 333, row DD, seat 281. Is it possible to advise me of the view from both these levels? Thank you. Hi Christy! Block 057 is floor level but (retractable seating) slightly angled view but should be fine from seats 162/163. You should be able to see the entire stage as well as a large screen. Block 057 is arguably not the best location for sound but should be fine for a comedy gig anyway. Block 333 is highest tier and second from last row. That said the viewing angle is still ok from there. We have a photo from Block 332 above so check that out to get a rough idea of height/distance/angle too. Hope that helps. Enjoy the show! I’m looking for an end of aisle seat have been offered section bk214 do you know what the end seat numbers are? Hi Bill depends on the row and please do double check with venue if you must be certain of being on the very end but to best of our knowledge the seats go from 217 to 229/230/231 depending on which row you’re in. We’d probably go for the 217 end if buying ourselves. Thankyou for the fast response I appreciate the help. Hi Stacey, some seats in Block 012 are indeed restricted view. We can’t tell you exactly which (best to check with venue) but your seats are basically right on the aisle next to Block 011 so it seems quite possible that your view will be unrestricted. Fingers crossed! Will you remember to upload a pic after the show so that we can better advise future users? Hi , I have kevin bridges tickets for sept 2015 bk009 aa 102/3 are these descent seats ..will i have a descent view ? Hi Angela, yes they are decent seats and your view should be fine/good! Also you’re at/near the end of a row so getting in/out should be ok too Enjoy! 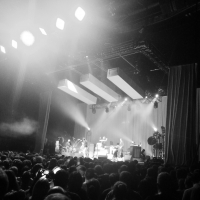 Do you have any photos from previous shows you could upload in the meantime? wanting to take our 11 year old to Clyde 1 live this December – her first big concert. Row A of block 57 is available (182-184) – any feedback on these seats would be appreciated. Worried that she wouldn’t be able to see the stage. Is this block raised from floor or at floor level? Hi Patricia – Block 057 is floor level but it’s also tiered. Although you are front row so will be at floor level. Hi, I’ve just purchased tickets for Kevin Bridges, next year. We are in Block 223 Row R Seats 51 & 52 How are these seats? Thanks . Hi Mars, yes Block 001 is close to the stage. Although Row P is one of the rows further back in that section, if you have a higher seat number (about 18/19+) this actually gives you a better viewing angle so you should be fine! Hi Alison, no Block 052 is not usually standing. If you look at our seating plans above and imagine you’re looking out from the stage, Block 052 is slightly to the right (coloured half-green and half-orange on our plan). You’re in the last row of that block this shouldn’t pose a problem and the viewing angle from there should be good! Enjoy – and if you have any photos from previous visits please do upload them! Hi I have just purchased seats in Bk 058 row j seats 178 – 181 – are these not great seats? Hi I have tickets in bk 231 row n. Is the view any good? I have seats booked, BK 002, Row L, seats 34 and 35. Is this a good position? 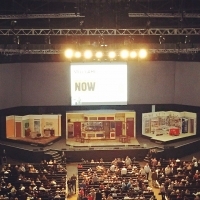 Hi Morag – if you look at the first photo in the second row above, this shows the view from Block 011 Seat 132 which is almost the mirror image of the view from Block 2 seats 34/35 save that you will be sitting a few rows further forward You should have a pretty good view of the full width of the stage as well as the screen at the top left (as you look from the audience). Have a good time and please do upload a stageview pic to seatradar.com! I’ve got tickets for Block 52, Row H, but the seat numbers are 63&64. From the online seating plan I’ve seen, these seat numbers are actually in Block 53. I can’t get through on the phone to check this, can you advise? Sorry Michelle – we’d agree with you on that so best to check with the venue! Maybe ping them an email or tweet them? Hi there I have just purchased tickets to see Kevin Bridges in 2015, our seat numbers are BK002 ROW S SEATS 46&47 are these any good. Hi, I’ve just got tickets for Kevin Bridges in BK330 right at the back! I see from your comments that the view isn’t an issue but is the sound good? Hi Margaret, it’s difficult for us to comment on that really but the only issues we’ve ever heard about regarding sound has concerned some echo (depending on the setup) at the sides. Block 330 is directly in front of the stage so sound-wise we wouldn’t expect there to be a problem. Would love for you to report back once you’ve been and upload a photo – think you might be able to do that? Yes we will do. I know it’ll be great wherever we are! 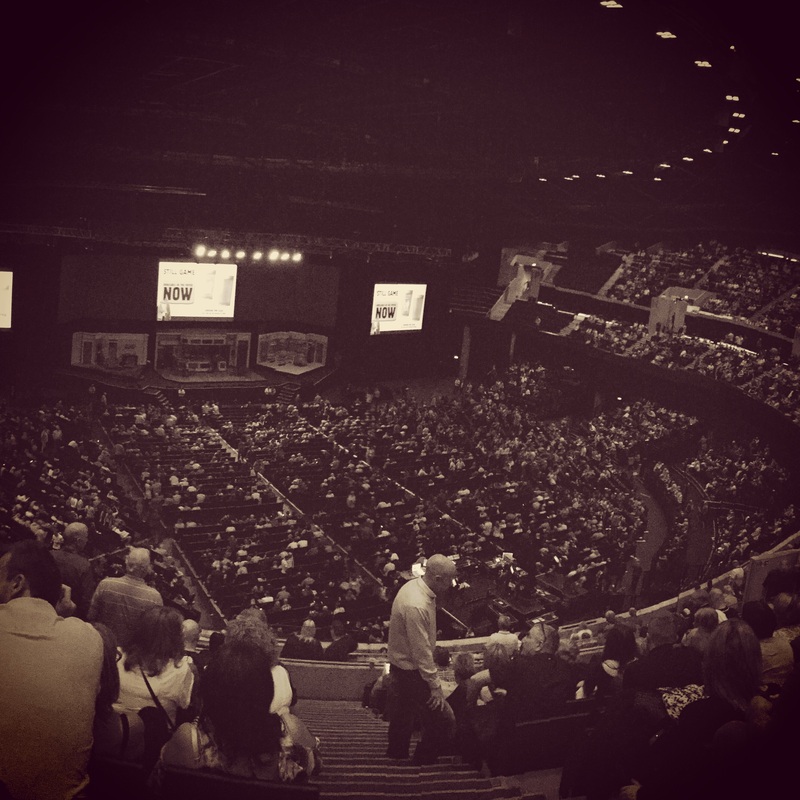 I have tickets to see kevin bridges at the sse hydro for his 2015 tour, i have seats in block BK 011, Row J… are these seats in the front of the arena, or whereabouts would they be located??? Hi Andrew – if you check out our “Fully Seated” seating plan above you’ll see that Block 011 is in the floor seating area, on the left-hand side if you were looking out from the stage. They are relatively close to the stage and Row J is actually only the 4th row back in that block so you should have a great view! Will you come back and upload a photo for the website after the show? Hi, could you help me please I’ve bought Kevin Bridges tickets and my seats are section BK 214 – row E – seats 227&228 . Really not sure if these are ok ? 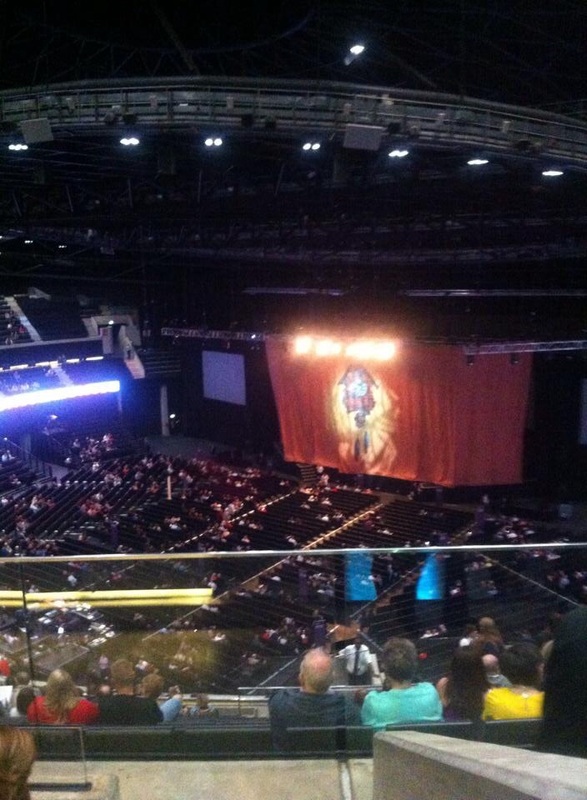 Due to the amphitheatre style layout most seats at the Hydro have a pretty decent view. No obvious problems with Block 214 and your seats are near the end of your row too which is sometimes quite nice in terms of getting in and out etc. Should be fine! Enjoy and don’t forget to upload a photo after the show! Have tickets for Paolo Nutini on 27/10/14 level 2 block 222 row n seats 33 and 34 bit concerned that view of stage and screens is going to be very restricted. Hey Louise, you will be looking down on the stage from a side-on view but you should be able to see the entire stage. As for the screen, you’ll have to turn to your side to see it but shouldn’t be restricted. The view from 222 is better than you’d think! We’ll ping you an email with a photo if you promise to upload one of your own after the show! Hi Roseann! First seat in that row is 127 so 130 is only 4 seats from start of row. Will you upload a photo for us after the show? Hi there, I have seats for 5SOS Block BK Row K and Seat 367-369, is this a good place to view the stage?? Hi Anna! We don’t recognise the block number? Are there no numbers after the BK? Are you perhaps in Block 236? If so, check out the photo from Block 232 above. You’ll be closer to the stage in that you’ll be further fwd in the arena but you’ll also be more at an angle although not so side-on as to be an issue. It says on the ticket Block BK was really confused haha! have bought tickets for kevin bridges on 3/10/15 , seat BK 326 row FF seats 95 and 96, are these seats at the very back, and is the view ok.
Hey Laura! Don’t worry! Yes the seats will have a somewhat angled view but as long as you can also see the screens (as far we know it’s tough from 222 but fine from 223) you should be fine. Also the view (even from 222) just isn’t as bad as people think. Unfortunately we don’t have a photo we can post here just yet but if you follow us on twitter (@seatradar) and send us a tweet we can show you one from 222 by direct message. Hey Robyn! The tickets are near the back of the highest section so there’s no denying you probably won’t be able to see the sweat on Kevin’s brow without the screen (probably a good thing). But fear not – the amphitheatre arrangement of the Hydro tends to mean the view is generally better from these sorts of locations than you’d expect. Check out the very last photo above. It’s from Block 332 which is more or less in a similar position to 326 just from the other side of the arena if that makes sense. You’re not much further round or back than that so the view should be fairly similar and you’ll definitely be able to see at least one screen. Add to that the fact that comedy is principally about being able to hear (which you will!) and we think you’re set for a good night no matter what! All the best and don’t forget to upload a photo for us once you’re there! you’re sat directly behind somebody very tall you should have a decent view. You’ll also be able to see a screen for close-up viewing. Btw – shouldn’t be an issue for a comedy show but we’ve heard some people complain that Block 057 isn’t great for acoustics at a live music event – we just mention that for future reference. 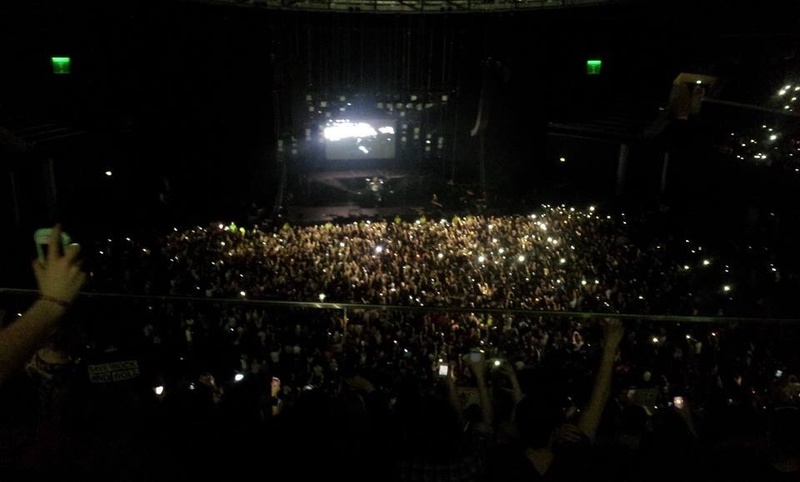 Would you be able to upload a photo of your stage view after the show? Thanks for your reply. I’ll definitely upload a photo to your site after the show. Hi Graeme – yes, these should be fine. 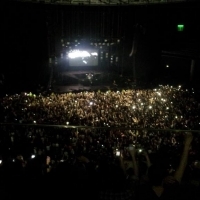 Would you be able to upload a photo of your stage view after the show? Hi just bought tickets for Kevin Bridges, Block 205 row B. Are these too far round and too far back to be watching a comedian? Hey Hannah – no, we don’t think so – and it’s really more about the jokes/stories than the visuals anyway right? You should have an ok view from there and you can look at a screen if you want to see in more detail. Would you be able to upload a photo of your stage view after the show? Hey Caitlin, they’re on the second level so slightly raised but Block 216 is towards the front of the stadium (i.e. 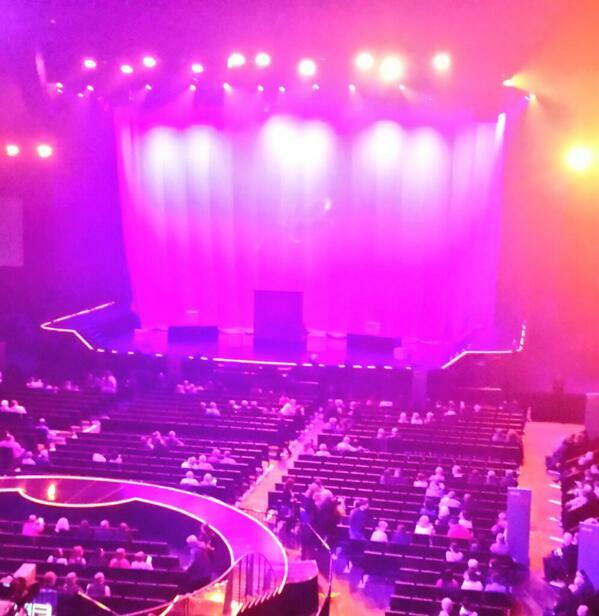 towards the stage) and the viewing angle from there should be fine so we think you’ll have a great time! Would you be able to upload a photo of your stage view after the show? Hi, could you tell me where abouts is BK 007 SECTION, ROW LL, SEATS 70 & 71 and is the view good? Hi Catherine, looking out from the stage they’d be at the rear of the floor seating on the right. You’ll be sitting pretty close to the mixing desk and – if you see the second last photo above which shows the view from there – that should mean you have a great view! Would you be able to upload a photo of your stage view after the show? Hi I have just got tickets for strictly come dancing for 4 people. They are BK 058, row F, seats 212 – 215. Panicking now that they won’t be decent seats as it’s for my mums 70th birthday treat. Hi Ivana – first of all Happy Birthday to your mum and well done for buying her a lovely treat! And…don’t panic! The “stage” (dancefloor) is set up in a different position to the usual gig arrangement so actually, you should be fine! Here’s a link to the seating plan so you can see how it will be set up (www.ticketmaster.co.uk/seatingchart/444745/14611) – hope that helps and have fun! Follow us on twitter (@seatradar) so we can look out for pics/tweets from the show! Hi Mike – if you look at the first photo in the second row above, this shows the view from Block 011 Seat 132 which is almost the mirror image of the view from Block 2 seat 36 save that you will be sitting a few rows further back. You should have a pretty good view of the full width of the stage as well as the screen at the top left (as you look from the audience). 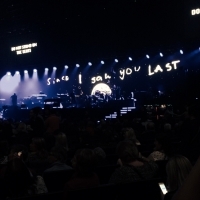 Have a good time and please do upload a stageview pic to seatradar.com! Hi Linda, which block are they in? 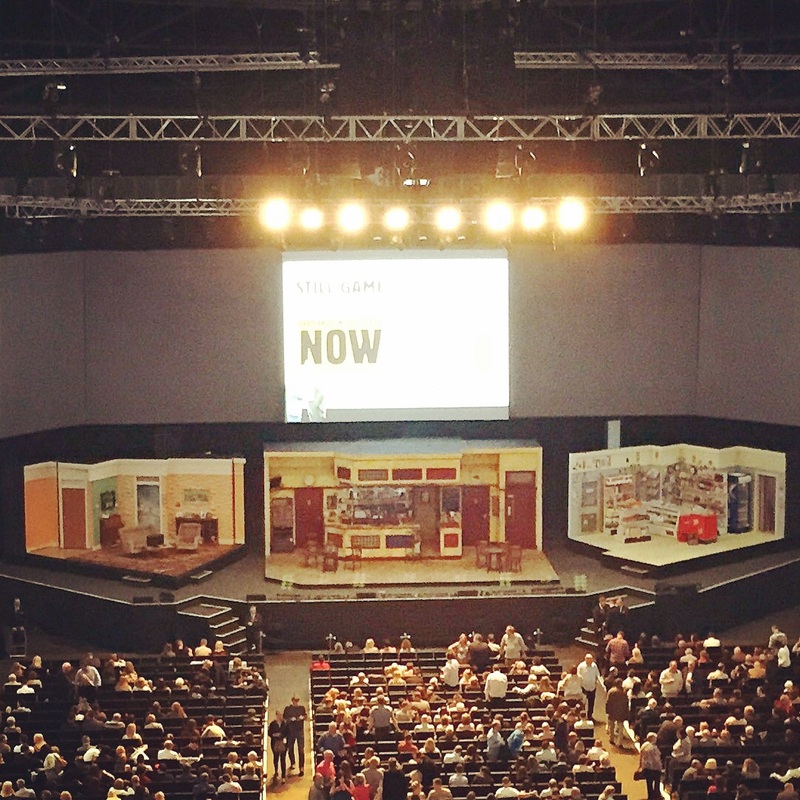 We have tickets for still game next Thursday 2nd October. We have seats 301 & 302 in block 333 row ee. We hear that getting to this area is not that good any other comments on this. sorry block 7 row ee seats 74 and 75, are these good for sound and view? I have bought tickets for The Script in Febuaray and my seats are section BK 326, row AA, seats 92-93! Are these seats any good?? Hi Georgia – they’re going to be pretty high up (highest level) but you should have an ok viewing angle. Row AA is the 5th row back in Block 326. If you look at the second to last photo above (from Block 233) you’ll be about 5/6 rows further back and further up (and you’ll be in the opposite corner), not sure if that helps much! 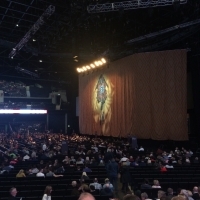 People tend to report that almost all seats at the SSE Hydro are pretty good so we’re sure you’ll have a great time and please don’t forget to upload a pic after the big night! Yes Nice and central and although further back you should still have a great view. Have a nice time and remember to upload a photo of the view to seatradar.com! Hi, booked tickets for still game next wednesday (1st october) in block 058. What are the seats like? How restricted is the view etc? Hi Matthew – we don’t have first-hand experience of the Block but – in honesty – we haven’t seen/heard great things about it… The view may well be awkward/restricted. Nevertheless, it will depend a bit on where exactly you’re sitting. The lower numbered seats (around 175) would probably offer a better view than higher numbered seats in that block. I am desperate for 2 x tickets to Still Game a week on Friday. The only tickets that seem to be available through ticketing website is Block 58, Row B, Seats 208 & 209. If I buy tickets here, do you expect me to not be able to see half of the stage? Hi Craig – in honesty, we haven’t heard great things about that Block. The view may well be awkward/restricted. One thing to mention – you say the seat numbers are 208/209 but the usual setup means that Block 058 only goes from 175 to 185 so maybe just double check with the ticket seller that the details are all correct. 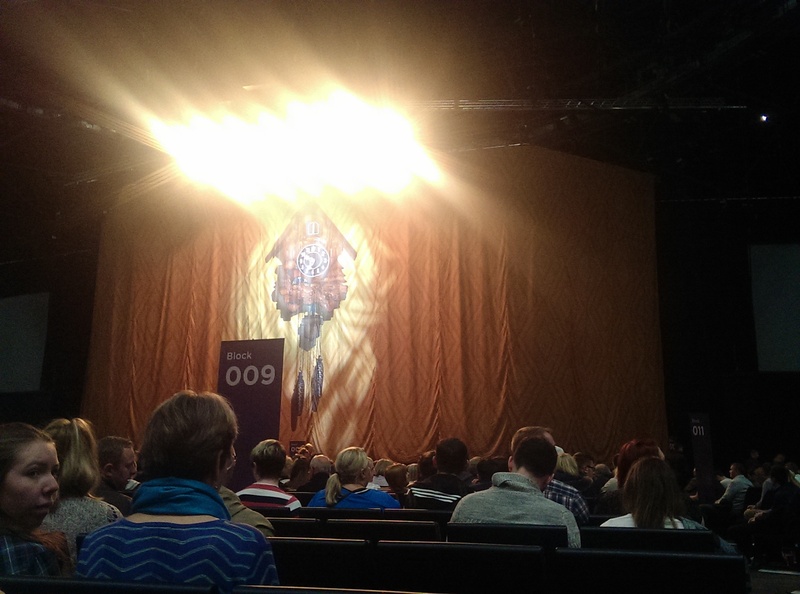 If you do decide to sit in Block 058, the lower numbered seats would probably offer a better view. Hi We have tickets for still game in block 235 row k and I am presently on crutches, will this be ok? Hi Pam, sorry to hear you’re on crutches! We wish you a speedy recovery but unfortunately that question isn’t really something we’re able to advise you on – your best bet would be to email the venue directly. If you get a response and feel like sharing it here for future reference that would be great! And don’t forget to post a photo of your view! Enjoy the show! Hi Chris, the view is from a slightly higher position but this isn’t a real issue and the viewing angle from Block 233 is fine. The second last pic above is from Block 233 and the one before that is block 232 so they should help you get a rough idea. Enjoy and please remember to upload a photo! Hi, we are thinking of buying tickets for still game. The seats available are in block 233. Will we get a good view from there.thanks very much in advance. Hey Rhona! Yes Block 001 is at the “front” of the stadium but as you say, it is a side-on view. In Row J you’ll have a better view the higher your seat number (ideally 16 or more) but the stage is usually raised so you should still be able to get an ok view from most of the seats in Block 001. 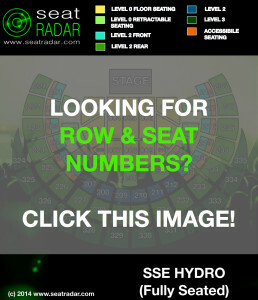 Please remember to upload a photo on seatradar.com after the show for future gig-goers! Thanks! Hi, I’ve just booked seats for Australian Pink Floyd. Block BK001 Row J, can you tell me if these seats are near the stage but to the side of it? Hey Ruth! Row S goes from 118 (towards the stage) to 141 (next to the aisle) so seats 130/131 are pretty much bang in the middle of the row! Hi David, we can’t be 100% since for some reason the SSE are unable to clarify directly but we’ve asked some of our users and our understanding is that GA always means general admission. The seating plan shows no seating in the GA area. We believe that tickets are sometimes given numbers (either by having GA0, GA1, GA2 etc) or by printing “seat numbers” on them for two reasons: 1. to keep track of inventory (i.e. how many tickets sold); and 2. sometimes this is to control entry/exit etc i.e. everybody with “seat numbers” 0 – 200 to go in first or into a specific section etc. Hope that helps – please do let us know what turns out to be the case on the night so that future concert-goers can know for sure! Thanks and remember to upload a stage view photo from the night! Our seats are section-STAND Row-GA4 Seats-248-250 I cant work out where on the plan that is as i dont see those numbers.Any help you can give me to work this out please?thanks. Hey Joanne! The GA means “general admission” and we’d usually expect this to mean unallocated standing tickets. We actually called our friends at the SSE Hydro for you (!) and the codes/numbers on your tickets don’t seem to be standard SSE Hydro codes/numbers – did you buy these tickets through an agent? If so, they’d probably be your best bet for finding out! We’d love for you to let us know when you find out! iv just bought slipknot tickets today (jan 15) for my partner. I bought them through the sse website. they first said standing but after I had bought them iv also been given a ga4 code! see below. Hi Lorna – thanks for taking the time to check our previous answers on this…unfortunately, we can’t add much at this point since last time we checked with SSE Hydro they were unable to clarify. That said, one of the previous posters that asked this point is going to his gig late this month so we’ll try to touch base with him and see if he can shed any light.